Infographic: Are We in the Midst of a Sixth Mass Extinction? 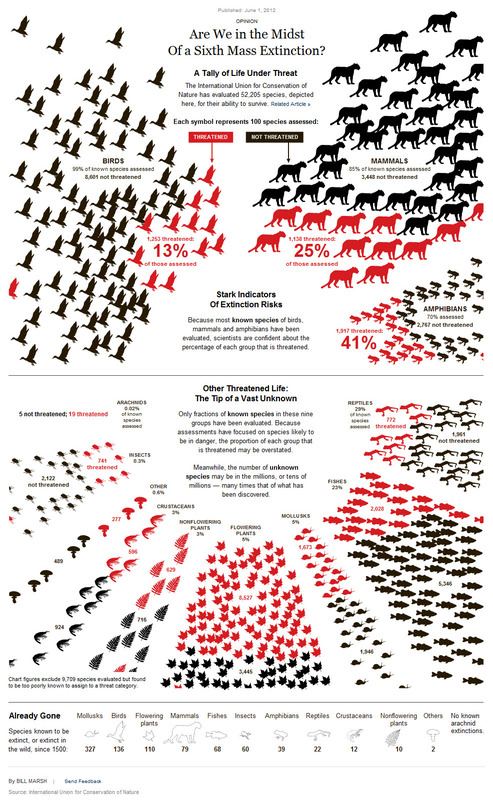 Bill Marsh’s black-and-red image depicts species at risk of extinction, based on data from the International Union for Conservation of Nature. When it comes to designing infographics, Marsh says there’s a dance between visual appeal and clarity of information. For example, he chose a big cat to represent all mammals because, “right away [they] convey that we’re talking about a certain type of animal, and big cats in particular are threatened.” To signify threatened flowering plants, he chose a maple leaf, because not all flowering species have the typical floral bloom. “We didn’t want to give people the wrong impression by literally selecting a flower image,” he says. An important infographic. My suggestion would be to show the extinctions round the outside encroaching to the center, rather than the other way around. As it is, the eye/brain imagines that there are plenty more creatures OUT of the frame, as the expansion is assumed to continue.